School’s finished for the year! The last week of school was a little bit crazy with class parties, concerts, chapels, etc. To finish out the year, Josh, Bella, Deacon and I went up to school to cheer on some of our favorite seniors as they got their diplomas. Bella made a beeline for her camp counselor from last summer! I also got to see one of my friends from high school….and middle school….and elementary! In fact, he was my first big crush and his name is Josh, so I’ve writing Val + Josh in my notebooks for a long time now! I told my Josh to get in the picture so I could have a pic of my first crush and my last crush! Now that school is out, all my focus is going to packing. Or, it’s supposed to be on packing, but I’ve just started official Chicago marathon training so I find myself thinking about that, pinning articles, and planning routes a lot! I’m so excited to train in the US!!! Every time I blink, my kids move up a grade! 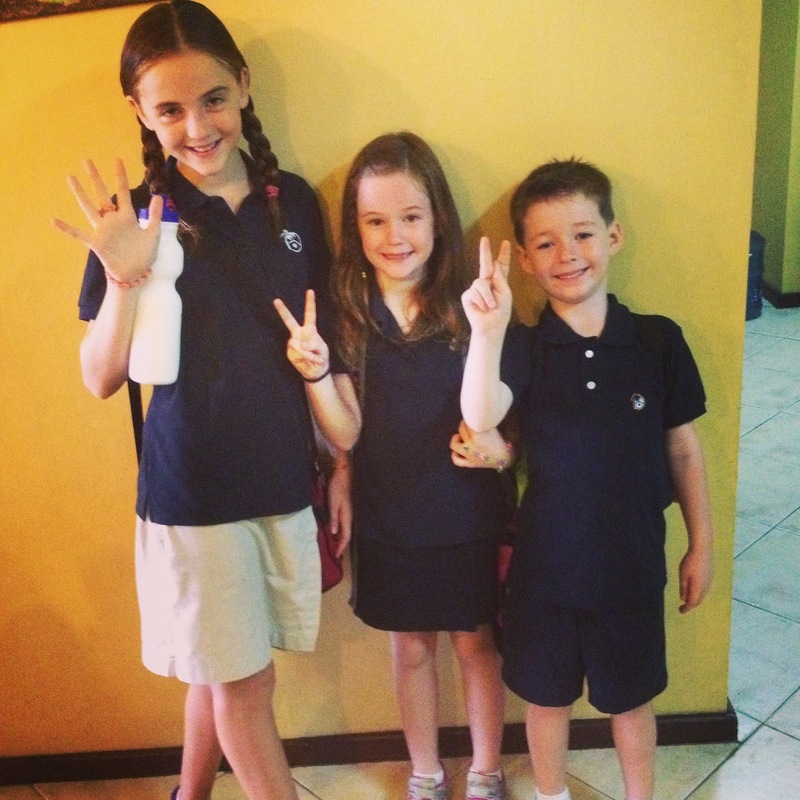 We’re in the last week of school now, and I can’t believe that when Mackenzie starts 7th, Bella starts 4th, Deacon starts 2nd, and Caleb starts preschool, it’ll all be new and scary and exciting in the US. I wish I was more excited about our year in the US, but truthfully, I would absolutely LOVE to go back for the summer and see all of our friends and family, squeeze our nieces, nephews, and cousins, plump up on our favorite restaurants, and celebrate the 4th in the US, but then I would love to come back here for school, volleyball, and life. This is home. There is home. And other Seuss-y thoughts. But this post is meant to be about bringing lunch to the kids at school. I’m not sure how it turned into the philosophical thoughts of a culture un-shocked lifelong missionary. 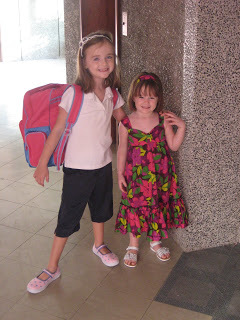 So yeah, nothing thrills our kids quite like us showing up at school with McDonalds take-out! I’m not sure if it’s us or the McDonalds that makes them feel so special in front of their classmates, (whatever, I SO know), but I can tell that their chests are puffed out a little more than usual. We got them Happy Meals, which means that their friends swarmed us to get a good look at their Angry Bird toys. After we all ate together, I took Simeon on some toddler-friendly playground equipment, while Josh and Bella went to dominate the four-square game. As I watched him approach the game, I realized that I had the same excited feeling that I used to get when I watched him play basketball in college! How funny and weird. This week is all parties, games, and goodbyes! Thankfully, and I know this from experience, MK’s rock at “goodbyes.” It’s totally normal to say “peace out” to your best friend, because you know that you’ll see them again in a year. It’s still sad and there is grieving, but MK’s can have the unique ability to see past the tears. 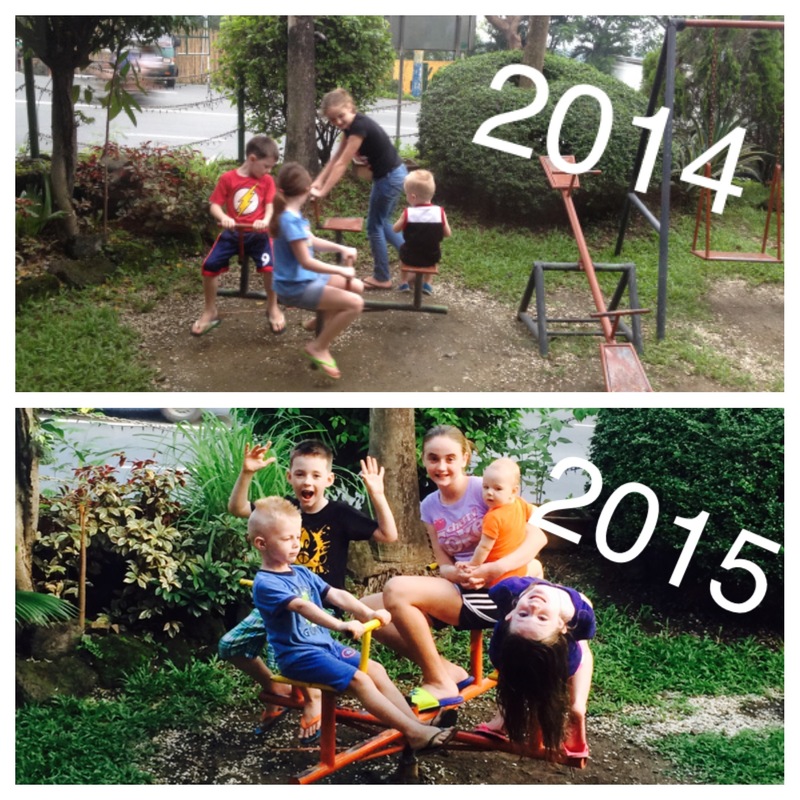 It’s a huge character strength and I’m so thankful that my kids are developing it! This week in elementary chapel, both Deacon and Bella’s classes were sharing songs, scripture, and thoughts that they’ve learned recently. It’s always precious and special to hear little children singing their hearts to Jesus! Looking for Deacon? Find the head that is closest to the ceiling – standard operating procedure up in here. Simeon LOVED the choreography that the students were doing and he did his best to keep up. In one of their songs, some kids were allowed to rock out during the bridge. Deacon and Seth gave hair bands a run for their money! They each shared an excerpt from the life and ministry of Paul. 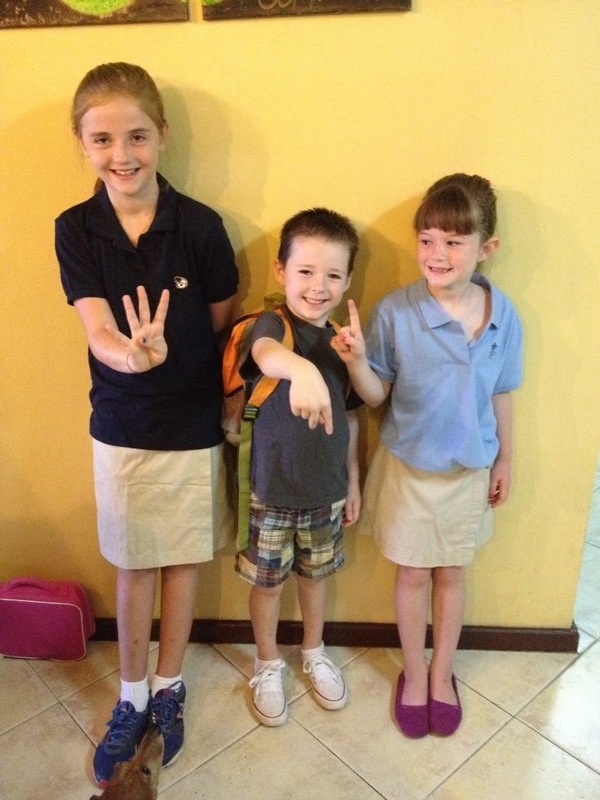 Do they really only have 3 more weeks until they are in 4th and 2nd grade?! The high school had their production of Seussical: The Musical last week. In keeping with the hoopla, the elementary school had a Seuss-themed literacy day, where each of the students dressed up as a Seuss. Deacon and his buddy (as well as 185 other elementary students) dressed up as Thing 1 & Thing 2. When we got to school, the kids all got together in the circle for a big seussy live museum. Bella found her bestie, in both real life and in Who-ville. That night, I took the older 4 to see the musical. It was so great. Caleb couldn’t really follow the storyline and would start to get bored, but then the monkey boys would come onto stage and do jumps and flips, and he would get enthralled again. The girls loved seeing their camp counselors, who are also my volleyball girls, so we all loved the performance. We’ll miss next years production, so I hope it isn’t something awesome! The last time we went on furlough, they did Beauty & the Beast, and apparently it was a-mazing. After much running around, putting costumes together, and practice, practice, practice, it was finally time to perform!!! To make things extra interesting, Josh was still in Australia, so it was up to me to make sure each of my kids was on stage when they needed to be, in the right costume. I did have a few minutes before the show to chill out with our buddies. It ended up being such a fun night! The first act of the night was Deacon and his 1st grade class doing a Disney song medley. They were so very cute! They sang and danced to excerpts from Zip-a-Dee-Doo-Dah, Chim-Chim-Chimaney, The Bare Necessaties, and Under the Sea. The “awww’s” and “So cute”screeches were audible throughout the entire song! Here is Deacon and his friend backstage. After that performance, I hustled Deacon to the bathroom to change into his presidential costume. He and a bunch of other kids, including Kenzie and Bella, performed “What If” by NRG. Mackenzie was a “band” member, Deacon was a President, and Bella was a Big Film Star. After that song, Deacon was hustled once again to the bathroom to put on his costume for the “Whip and Nae Nae” act. His PE teacher (a JBU alum!) put together a PE-inspired dance for a bunch of elementary students. Here they are backstage. I think they got the biggest cheers of the night! Then it was time for Mackenzie and my act! Mackenzie and her friends had been wanting to do something for Talent Night, so one of her friends mom’s came up with this idea. Along with a bunch of YouTube videos, we put together a medley of songs and dance moves. While I was running in and out of the theater, Caleb was in the charge of Bella’s best friend. I think it was her first babysitting job, so she felt pretty special and did a great job. It was fun to be so involved with the show! It’s been a few years since my junior class hosted Talent Night. Like, I have to use almost all my toes and fingers to count. Last week, Josh and I chaperoned the StuCo banquet at one of our favorite restaurants in the city. It’s a revolving restaurant way high up in the sky. I couldn’t find a dress that I liked for a price that I liked, so a few days before the banquet, I dug out some fabric that I bought 10 YEARS AGO and has been sitting in my closet all these years! The seamstress whipped up a cocktail dress in a couple days (a major benefit of living here!) I really love how it turned out. I might do my grocery shopping in it next week just so I can wear it again! We arrived early so that we could monitor the students as they arrived. There were some dress code restrictions, so we had to be on the lookout for violations. Thankfully, we didn’t have to send anyone away. I’m not sure I would’ve been so good at kicking a kid out of their fun evening! Some of my friends were also chaperone’s, so we pioneered the photo-booth line. Before dining, there was a program of beautiful performances. These kids are so talented!!! Then came the food. We had ribs, salad, rolls, and rice. Ribs. Perfect for fancy clothes! They were good. Not Kansas City good, but good! I had a fun night with my main squeeze. We had a lot of laughs. Two of my volleyball girls snuck up on me while I was reapplying lipstick with the camera. And the rest of the team. They are so pretty. This is more our personality as a team. While everyone was taking pics, Josh cleaned plates. This one belonged to one of my volleyball players. The fudge cake was really delicious! The banquet was over by 8 and all of the kids graciously laughed when I asked them where the after-parties were, so Josh and I met up with some other friends in the area. It was a fun way to finish out the fun evening! Ach-eee-double-hockey-stick week is OVER! The first-ish week in August is the busiest week of the year for me. I have to get the older three off to another school year, plan and run volleyball tryouts, and celebrate two of my kiddos birthdays. I thought it was busy 10 years ago, when I just had Mackenzie’s birthday and volleyball tryouts. Then I went and had another baby the same week! On top of all of that, Simeon decided to start waking up during the night! We’re going on 5 nights in a row, so that’s super-fun. I’m hoping he’s just teething and he’ll go back to normal very soon! Speaking of Simeon, he is brand-new to the night-before-school-starts-feast at a nearby restaurant. We have started a tradition of talking about goals, behaviors, relationships, etc the night before school starts. They have a little playground outside, right along the busy street. Nice. After we order, the kids play and Josh and I enjoy the quiet! The first day of school was a success! The kids were ready to go by 6:30. By the end of the school year, we’re still tying shoes as we run out the door at 7:05, hoping to slide right in on time at 7:10. 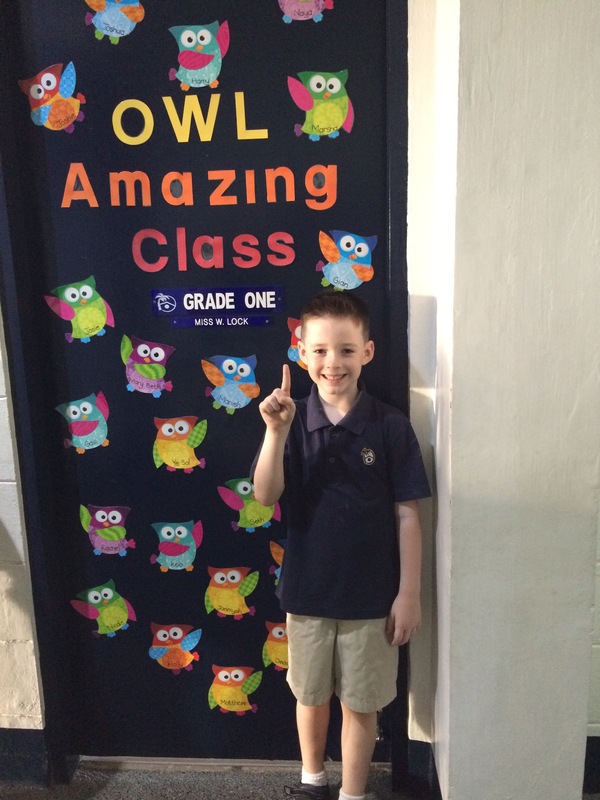 When we got to school, I snapped a photo of Deacon in front of his classroom, but Bella ran off to the playground in a blaze of glory, so I didn’t get her pic. 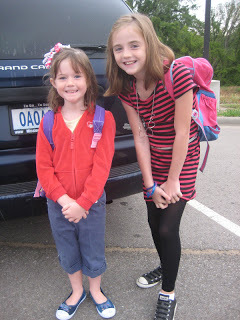 Then I walked with Mackenzie over to the middle school building. Middle school! She’s pretty excited about starting 6th grade. 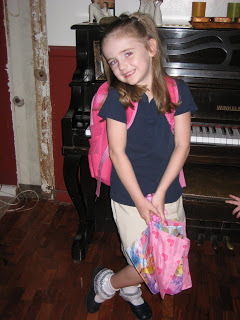 She’s about 5’6″ now, so it’s hard to find school uniforms that fit quite right. 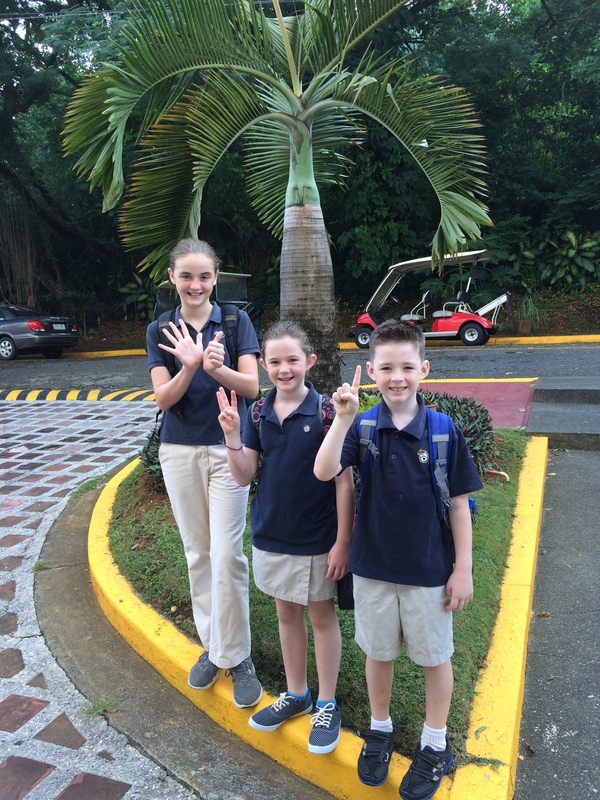 Not many 11-year-olds are 5’6″! 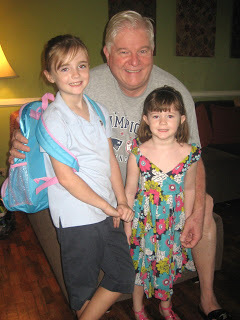 When I got home from school, I wasted time went through all of our first day of school photos. How does it go so fast??? !